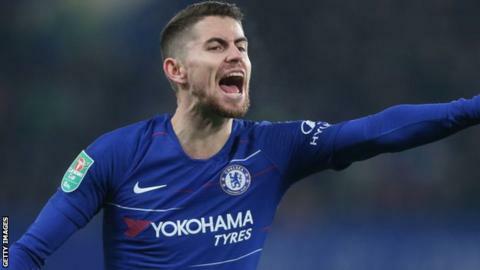 Chelsea boss Maurizio Sarri says midfielder Jorginho needs his team-mates to develop their "understanding" of the manager's preferred style. The Italy international joined former Napoli boss Sarri at the Premier League club on a five-year deal last summer. But as Sarri has so far struggled to impose his methods in England, so Jorginho is yet to live up to the £57m fee that brought him from Serie A. "Jorginho has a very strong character, a very strong personality," said Sarri. "I can believe that he has no problem to play under pressure. He played very well in the last match, better in the second half than in the first. For him, it's very important to finish the match in that way. "I think that he can do better. But he needs all the team to understand very well our way of football." Kepa Arrizabalaga's refusal to be substituted in the Carabao Cup final had raised further questions over his manager's authority in the Chelsea dressing room, following heavy league defeats by Bournemouth and Manchester City in the league. However, the Blues responded to a turbulent period by beating London rivals Tottenham in their last match to ease some of the pressure on the Italian. And with 19th-placed Fulham next up, Sarri has his sights on a top-four finish. "The pressure is inside," Sarri said. "I felt big pressure in Serie C, and very little sometimes in the Champions League. It's really very important your feeling at the moment. "Napoli is not a small club. And the pressure is a lot higher there than here. Every match is very difficult and mentally very expensive. "You risk arriving at this moment of the season really very tired, more mentally than physically. In England, the season is really very difficult. "The target of my club is to return in the Champions League. I would be really very happy."